What are your transfer station licence numbers? Transfer Station licence numbers: Bury - 50434 & 53823, Oldham - 53932, Ramsbottom - 100969. and Failsworth - BP33 96CF, which are all issued by the Environment Agency. What is our waste carriers licence number? Do skips require a permit? Skips on the road must have a permit, we obtain this from the local council. We provide lights and cones but the hirer must ensure they are lit and cones remain correctly positioned. The maximum size allowed on the road is an 8 cubic yard skip. You do not need to prebook waste being brought in to Bury, Oldham or Failsworth transfer stations. Just turn up during our opening times to tip. We ask that you telephone in advance for hazardous waste to provide addresses and contact details for administration. Please note Oldham and Failsworth are not licenced for hazardous waste or tyres. Skips and rolonofs must be no more than level full. Clay, soil, brick, concrete and tarmac can render the skip too heavy for the legal weight limit on the road. It is your responsibility to ensure the skip is not over weight and excess is removed at your expense. You will be charged a lost journey. Who is responsible for the skip I hire? Skips are left at the hirer's risk. Damage to driveways, footpaths, water mains, telephone and electric cables will be the responsibility of the hirer. Damage to skips either by fire or overloading, and skips stolen will be charged for. Non-payment of services will result in your waste being returned and tipped on the hirer's site. Yes, however we do not take the asbestos off the building, we just supply the container for transportation and disposal. All breakages must be avoided when removing cement bonded asbestos to prevent asbestos becoming airborne. All asbestos does need to be double bagged and it does have to be in a lidded skip. Do you offer destruction notices? Destruction notices can be issued. The goods are destroyed by shredding and granulation. The small sized light waste is then loaded and sent as SRF (Waste For Energy), ie burning. How do we transport hazardous waste? All hazardous waste must be covered at all times, (asbestos must be double bagged) and accompanied by a consignment note, which we can provide. What should I bring when tipping asbestos at your Bury Transfer Station? You will need a mask, disposable overall, gloves and consignment note. Transport must be in a lidded container or sealed van with asbestos marker plates. Other site rules are a hard hat, reflective vest and steel toe capped boots. Strictly no smoking on site. Who regulates the waste industry? Our service area is Greater Manchester, however the further afield we haul waste the higher the price for haulage. Do you dispose of tyres? Yes, we accept all types of tyres, super singles, other wagon tyres, earth mover tyres and car tyres. Tyres are shredded by Wheeldon’s, those with rims are crushed to remove the rim before shredding. Should I take precautions when handling hazardous waste? Masks, gloves and disposable overalls must be worn when removing and handling hazardous waste as a minimum. WEEE goods are waste electrical and electronic equipment, basically it includes anything that plugs in. These must be recycled and not damaged during transportation and removal. It includes fridges, TVs, computers, printers, cookers, hair dryers, drills etc. Where can I get a premises code? Premises codes are no longer obtained for consignment notes. Part of the address can be used in the boxes as means of identification. What information do we need for a consignment note? For hazardous waste we need the sites name, address, post code, reason for disposal, contact name and telephone number. If another person or company is transporting/removing the waste, then we need their name, address and waste carrier registration number too. Can I mix general and hazardous waste? Hazardous waste must not be mixed with general waste because this contaminates the load and prevents recycling. How often do you empty my bin? Wheelie bins are emptied on a weekly or minimum fortnightly basis, on the same day each week. Payment is 3 monthly in advance. Do I need to call and prebook bringing general waste? You do not need to prebook waste being brought in to Bury, Oldham or Failsworth transfer stations. Just turn up during our opening times to tip. We ask that you telephone in advance for hazardous waste to provide addresses and contact details for administration. Please note Oldham, Ramsbottom and Failsworth are not licenced for hazardous waste or tyres. Hazardous waste must be booked into Bury by telephoning. Can I put hazardous waste in the skip I hire? Skips must not contain toxic waste, drums or other liquids, tyres, asbestos, solvents, oil, paints, pressure vessels without previous written permission from Wheeldons. We are licenced for these items but they must be booked in and loaded separately. Our site rules are issued in the office. Most importantly you must wear hard hats, reflective vest or coat and steel toe capped boots. All sites are strictly no smoking. How much will I pay to bring waste in to your station? 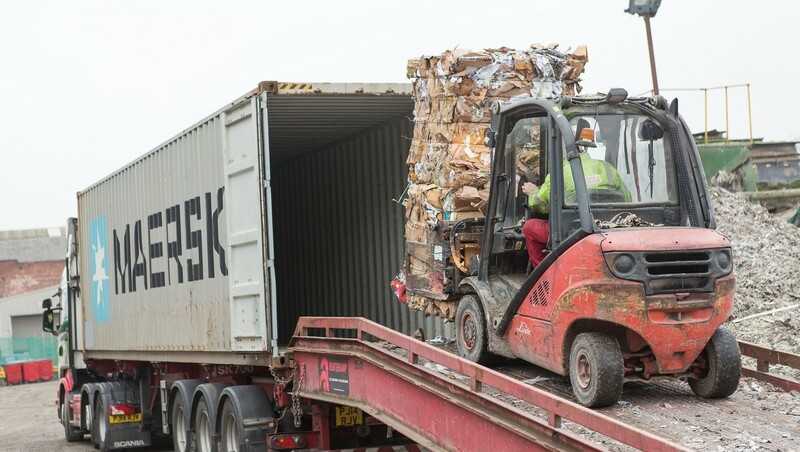 Industrial or domestic waste can be brought into our transfer station and the price is calculated by your weight on the weighbridge. Pre-treatment Law (2007) means all waste must go through some form of treatment to increase recycling. It is illegal for mixed waste to go direct to landfill. This law was designed to protect the environment, which we fully comply with. We have on-site mechanics for servicing and repairing our wagons, skips and compactor units. Do you take confidential waste? Yes, an industrial shredder will dispose of all your confidential waste needs. Your confidential waste charge is related to weight. There is also a destruction service for goods not fit or unsuitable for retail. All the waste received from you is constantly supervised to ensure you have piece of mind Your information remains completely private. How often do we review our drivers licences?